What makes H4 Training stand out from the rest? H4 Training was built with the goal of creating a gym community that would provide a remarkable member experience while delivering amazing results. 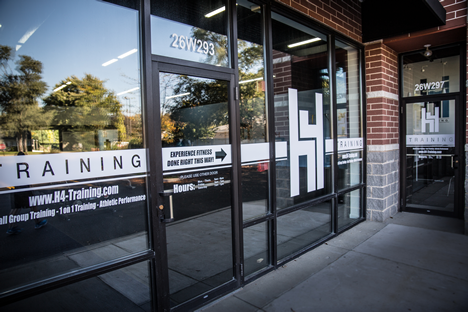 H4 Training aims to be a place that values and cares more about its gym community than any other place. We strive to be the best, deliver the true fitness experience, and build a community for those committed to making changes in their health and fitness. In our 3,000 square foot facility H4 Training utilizes effective training tools like Trx, dumbbells, kettlebells, VIPR training, sandbags, sleds and tires. We promise you that there is nothing ordinary about H4 Training, that we have the best fitness training facility in the western suburbs with the most attentive and knowledgeable staff … along with the most cutting-edge training methods. We invite you to be a part of the H4 Training experience and to join the H4 Community. Our passionate team of coaches is committed to the H4 Training mission and dedicated to serving you in a positive environment.